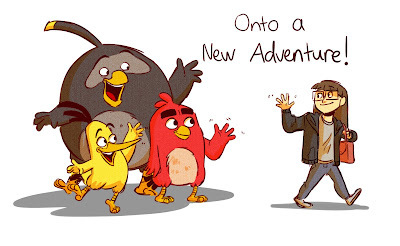 Today is my last day on the Angry Birds Movie, and it has been an incredible experience! I am so thankful for God’s amazing provision in this job, and for carrying me all the way through the production. There were many a challenging day, and looking back I can see how God used each experience to grow artistically, in maturity, and in trusting in Him. I am also so thankful for such an awesome crew and directors. Thank you Clay and Fergal for your mentorship and patience, and taking a chance on me to allow me to grow as a story artist. The Angry Birds Movie has been a fun and challenging ride, and I can’t wait for y’all to see the crew’s amazing work when it comes out. In a few weeks I’m going to be starting a new adventure, and I’m excited to see what the future will hold!